Hector Berlioz Les Troyens with Philippe Jordan conducting the Opéra National de Paris. Since Les Troyens headlined the inauguration of Opéra Bastille 30 years ago, we might have expected something special of this new production. It should have been a triumph, with such a good conductor and some of the best singers in the business. But it wasn't. Anyone can trot out superficial clichés about so-called modern productions, but it's far more important to understand why a production works, or doesn't. The starting point as always is the opera, and the ideas behind it. Berlioz captured the expansive, extravagant spirit of his time. France was resurgent, colonizing Africa and Asia, obliterating the defeat of Napoleon with new confidence. Paris was being rebuilt on a grand scale. Yet Berlioz, never a shrinking violet, intuited the hubris that comes with imperial glory. Les Troyens is flamboyant, but its backdrop is catastrophe. Empires are annihilated, nations forced into exile. Berlioz's orchestration reflects this turbulence, with blazing highs and apocalyptic darkness. Though Didon and Enée enjoy an interlude of heady bliss, that happiness is doomed. That idea of glory cursed by hubris remians powerfully potent today - perhaps even more so now, given what's happening in the world. Perhaps audiences don't want to be reminded about war in Syria (and Lebanon, where Tyre was) and of the hundreds of thousands of refugees in the Mediterranean, many escaping from the area that was Carthage. Fair enough. There's no more reason that a production should be set in period costume. In any case, Berlioz wasn't doing history enactment, and the audiences of his time were conditioned to the past as allegory, Classical Antiquity rather than Antiquity Realism. Berlioz's music was audacious, possibly the most advanced and adventurous of its time. Shock and awe were part of his aesthetic. Les Troyens doesn't have to be pretty - cosiness is decidedly not its message - but at least it should engage the mind. Dmitri Tcherniakov productions don't generally appeal to me because he tends to decorate rather than engage with what ideas might be in an opera. 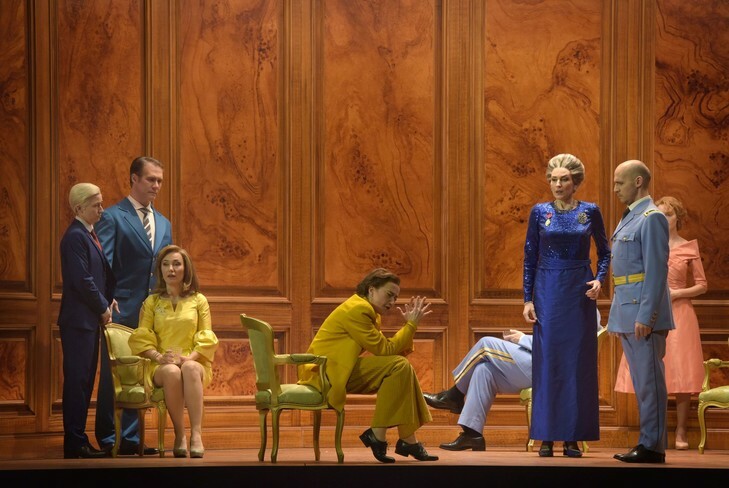 His Glinka Ruslan and Lyudmila for the Bolshoi was as inert as a Fabergé egg, (read more here), his Lady Macbeth of Mtsensk for ENO put Shostakovich on mute (more here), his La Traviata for La Scala died in the womb (here) and his Rimsky-Korsakov's Invisible City of Kitezh missed the magic so fundamental to the opera (please read Amsterdam's invisible, risible Kitezh here). But I loved his Bizet Carmen at the Aix-en-Provence Festival in 2017. The drama in Carmen isn't the kitsch surface so much as the way the characters act out their motivations to extremes. Thus Carmen as transaction analysis is not only feasible, but full of insight. Perhaps Tcherniakov was trying to recap that Carmen with Les Troyens, but frankly, he needs to work with a good dramaturge. Tcherniakov sets the Troy part of Les Troyens as a fairly typical tin-pot dictatorship, which is not wrong in principle, but there is a lot more to Berlioz's Troy than this. Cassandre is the central character, not Priam and his court, and she is cursed because she can prophesy the future. Stéphanie d'Oustrac was stunning, stealing the show by her vocal presence and instinctive feel for creating character. I was riveted : she's a force of nature. But all Tcherniakov had to offer her was a yellow suit , standing out from the blue shades around her, and when the Greeks burst in they hardly seem to figure. Anyone who didn't get the Horse in David McVicar's Les Troyens for the Royal Opera House should be forced to watch Tcherniakov til they squirm. There is no reason to assume, like the Trojans and Tcherniakov do, that the impending disaster is all in Cassandre's mind. 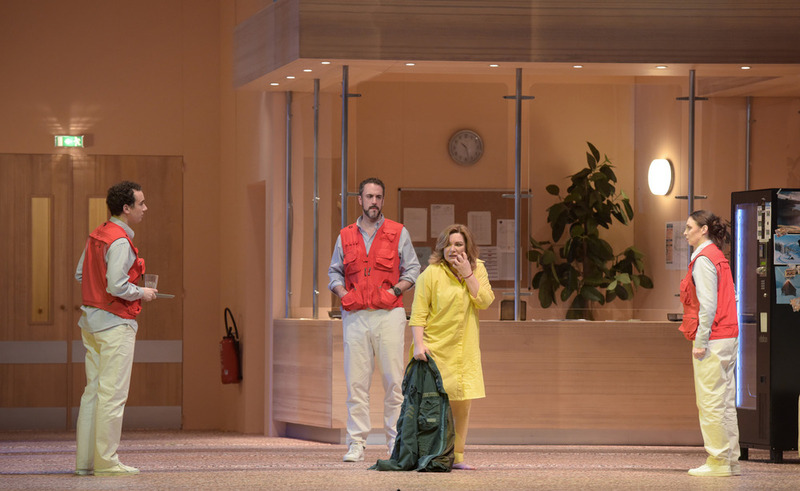 D'Oustrac's Cassandre was matched by Stéphane Degout's equally impressive Chorèbe, sung with such depth and conviction that he made the role come alive, so vivid and human : what a pity that Chorèbe has to die in the First Act ! Luxury casting : D'Oustrac and Dégout interacted so well, and with such verve that their performance would be memorable on its own terms. Carthage here is an anonymous office space, which worked fine in Tcherniakov's Carmen, because it evoked the displaced ennui behind the desperation of Carmen and her companions. But as the libretto makes clear, Didon's Carthage is a happy place, where people have built constructive lives. Didon is a much loved success : she's given others asylum, she's not "in" an asylum, needing help. Unless you think that being kind to refugees is madness. Had the performances of Brandon Jovanovich and Ekaterina Sementchuk been on the same level as D'Oustrac and Dégout, one might forgive the banal staging,. Jovanovich and Sementchuk weren't bad, but didn't quite rise to the heights, either. A rather depressing Royal Hunt and Storm, saved by Jordan's incisive conducting, splendidly luminous in the love scene, and demonic in the storm. So rewarding, in fact, you could enjoy this Les Troyens as an orchestral exercise. Very well cast minor roles - Véronique Gens as Hécube and Paata Burchulzade as Priam, who can still create character, Thomas Dear as The Ghost of Hector, Aude Extrémo as Anna, Cyrille Dubois as Iopas,Michèle Losier as a very fetching Ascagne, Christian van Horn as Narbal. At the end D'Oustrac, Dégout, Gens, Burchulzade and Dear return as ghosts, raising the staging from the grave. With this conductor, this orchestra and most of this cast, this Les Troyens could have been brilliant, but let's hope we won't have to wait another 30 years for a better production. This staging might be fine in some provincial house, but Paris is not the place for it.